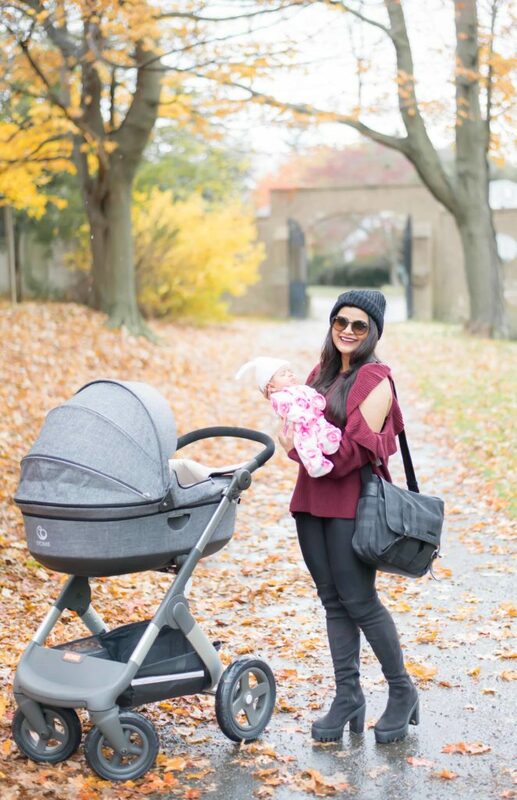 When I was doing my research for strollers, there were three things that I was looking for : safety, style and function. The Stokke stroller had me at the carry cot! It is ranked pretty high on safety. I just love its vintage looking style – like something straight out of a story book =)) Infact, this is one of the things that I receive so many questions on, each time I post on Instagram. 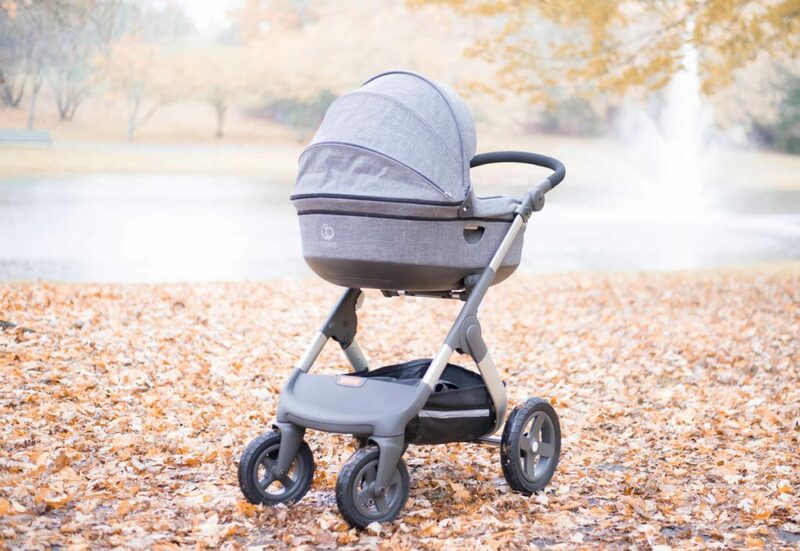 Here are some of the things about the Stokke Trailz Stroller that we love. My favorite thing about this stroller that also sets it apart from most in the market, is that the seat and the carry cot are placed high up to encourage eye contact. Now that Zoe has started to make eye contact and keeps her focus on our faces – it is fun talking to her while strolling. And then she flashes her precious smiles while we speak! You don’t have to hunch to talk to the baby with this positioning of the seat. 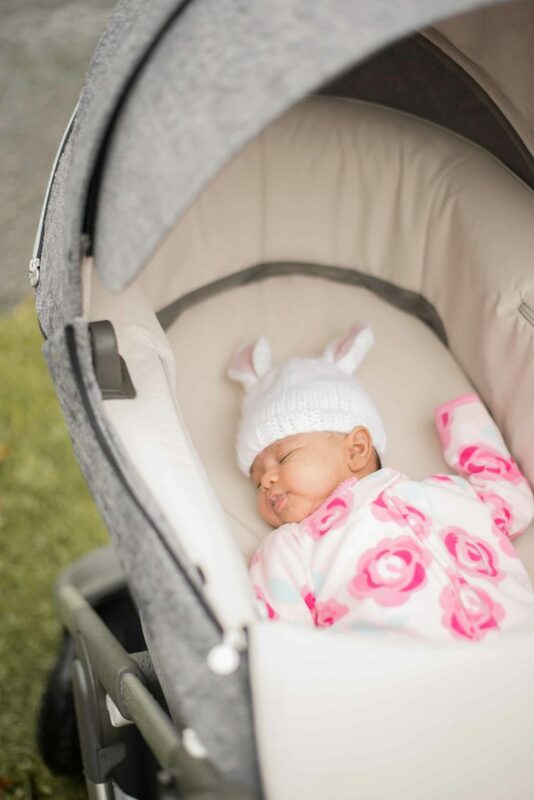 The Nuna car seat that we got, also fits into the stroller – so you don’t have to carry the cot or the stroller seat if you are going for a quick errand or your trunk is full. The large tyres on this stroller make it comfortable for the baby in all terrains. Which is great for us since we love taking walks (even in the snow), going into the city, going for hikes! The price point on this stroller is definitely a bit high, but it’s a beautiful stroller with some really great features. The only thing that I dint like about the stroller is that it doesn’t fold up as much so takes up a lot of room in the trunk. That stroller is so cute! 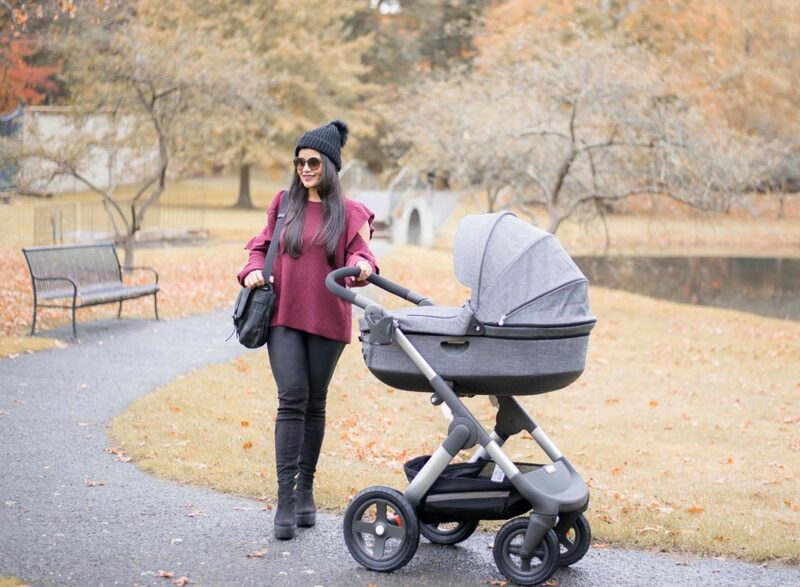 That stroller is seriously so chic and I love how convenient it looks and how comfy it looks! Also, you are looking so dang chic as well! First off, huge congrats on the new arrival of your sweet and precious baby girl! This is such a cute stroller! I love the vintage carriage design and that it has various components to switch out; I’ll have to keep my eye out for this one, as we’re looking to purchase another stroller soon. Thanks for sharing, babe, and I hope you have a great rest of the week! Such a cute stroller! And your little one is so adorable ! First of congrats on your little angel! She’s beautiful and I love the stroller! Stokke is one of my faves! That’s pretty much the sturdiest stroller I’ve seend. Your little girl looks really comfy in there. OMG you look amazing, Neha! Congratulations on your new bundle of joy. She’s absolutely PERFECT! I’m really happy for you. Btw, what a cute stroller! Sounds like an amazing one though. Thank you for sharing it!